The Shore is one of the 22 theaters in my new book “After the Final Curtain: The Fall of the American Movie Theater.” Find out more here. The Shore Theatre opened as the Loew’s Coney Island Theatre on June 17, 1925 in Brooklyn, New York. The 2,387 seat theater was built by the Chanin Construction Company, which was also known for the construction of the now demolished Roxy Theatre in Manhattan. 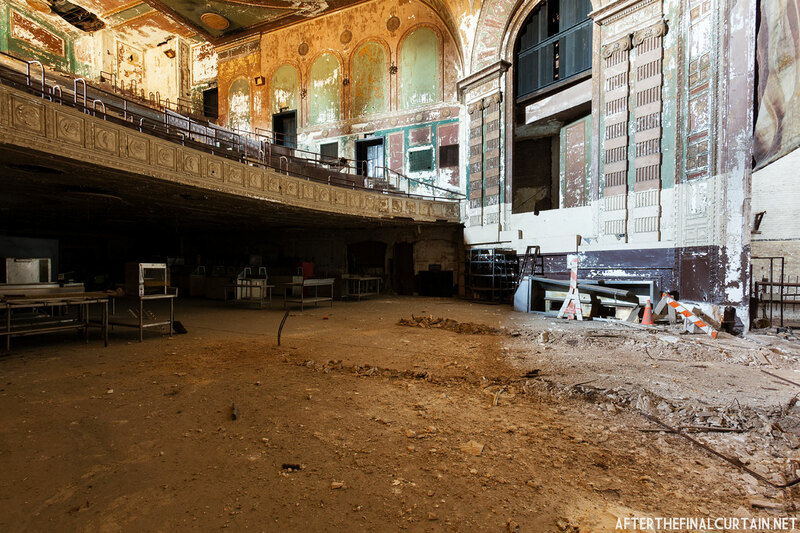 Before opening, the theater was leased to the Loew’s theater chain for an annual cost of $150,000. The Shore was designed in a Renaissance revival style by the Reilly & Hall architecture firm, who were proteges of famed theater architect Thomas W. Lamb. Reilly & Hall included a nautical theme in the theater’s design, due to the building’s proximity to the ocean. According to an article in the New York Times, construction of the theater cost over $2,000,000, ( $27,000,000 when adjusted for inflation.) The cost of construction was quite high for a theater of the Coney Island’s size, and that was due to the ground beneath the building being largely made up of sand. The Shore opening was presided over by Loew’s theater chain founder Marcus Loew, and included many of that era’s stars of stage and screen. Some of the many celebrities at the opening included; Johnny Hines, Barbara LaMarr, Mae Busch, Virginia Lee Corbin, and Teddy Sampson. Nine bands from various nightclubs around the city performed and the opening feature was the movie “The Sporting Venus” starring silent film star Blanche Sweet. According to an account by the Brooklyn Citizen, the crowd at the opening was so large it had to be cordoned by police. 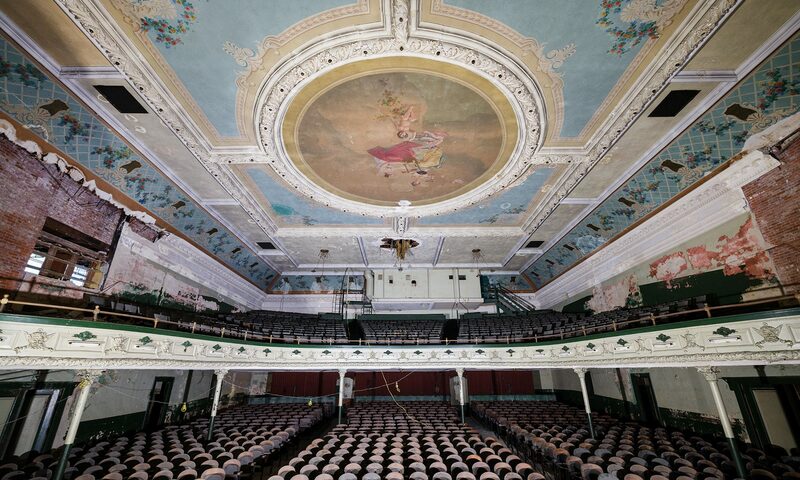 The theater was designed to be a combination house, showing both vaudeville and motion pictures, but eventually largely phased out the vaudeville performances, only bringing them back on special occasions. A water fountain in the theater’s lobby. On February 15, 1941, David Dolinsky, the manager of the Loew’s Coney Island, was being escorted to a local bank to deposit the day’s receipts by NYPD officer Leon Fox. A car pulled up alongside them and opened fire killing Fox. The robbers were eventually caught and sentenced to death, but the sentence was overturned after they appealed to the United States Supreme Court. Much of the proscenium arch has collapsed due to leaks in the roof. Evro Theatre Corporation acquired the theater from Loew’s Inc. in September 1964. Sam Kantor, the president of Evro, had worked for Brandt Theatres for almost 30 years, and continued to do so with his new company. Brandt handled the booking and advertising for the theater, which was renamed Brandt’s Shore Theatre. A little over a year later on January 1, 1966 the Brandt Co. switched the theater to a live performance venue beginning with a production of “Let’s Dance.” They attempted to appeal to Brooklyn’s large Jewish population by presenting stage shows such as “Bagels & Yox.” but that failed to catch on. On May 16, 1966, the Shore joined Leroy Griffith’s burlesque circuit with a show titled “Stars ‘n’ Strips Forever.” The burlesque shows were eventually phased out and the theater resumed showing motion pictures. The orchestra level was used to store kitchen equipment. By the early 1970’s, the Shore had turned to exploitation and eventually adult films. The theater closed permanently in March of 1973. Horace Bullard, owner of the Kansas Fried Chicken chain, purchased the building in 1978, and began to convert it into a casino. The seats on the main level were removed and the main floor was leveled before the state decided not to allow gambling on Coney Island. The Shore Theatre building was declared a historical landmark by the New York City Landmarks Preservation Commission on December 10, 2010. It was sold to Pye Properties for $20 million dollars in January 2016. In June 2018, Pye Properties announced that they plan on turning the building into a hotel with a a spa, banquet hall, and a bathhouse. They did not specify how much, if anything, of the theater will remain. 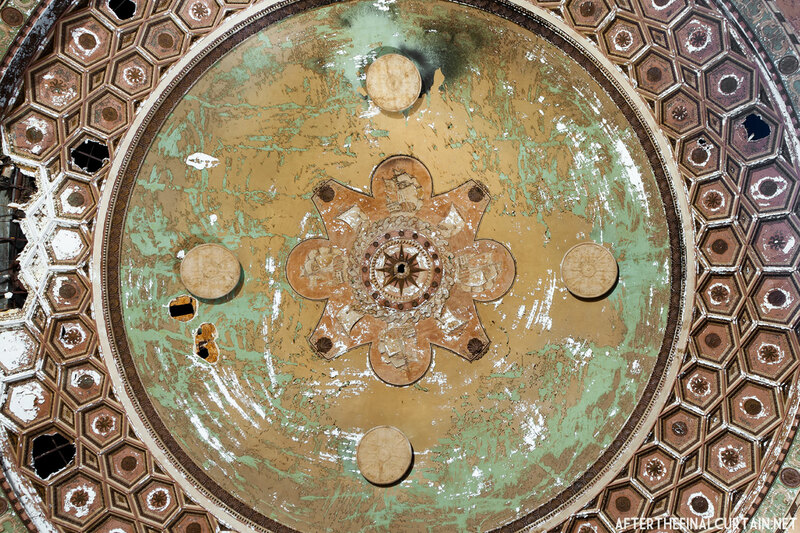 A compass in the center of the auditorium ceiling. More of the nautical plaster work that covers the auditorium ceiling. The foyer of the Shore Theatre. Great series on this theater! Still a beautiful theater. Great pictures. Anything being done to try and save the inside?? It’s beautiful. I can’t believe nobody is taking care of it. Fantastic pictures. I suddenly have an interest in this theater. It would be great if the Coney Island Film Festival did something there. This is somebody’s memorable place. Deserve to be landmarked. Great photos! i would love to to see this. Love old building. thanks. And I would love to go to this place! Thanks for this post. BTW, awesome photos! It’s unfortunate that so many beautiful places are left to decay. You’re photos catch the essence of the Shore’s crumbling beauty. Very nice. This place is so beautiful – despite being broken in some parts and falling apart in others. It exudes this amazing charm. Wonderful photos and post. Thank you so much for sharing! It amazes me how these pictures and accounts both makes me feel sad and intrigued at the same time. You can smell the decadence from here, it whispers of a forgotten past that seeks to be acknowledge and to be taken care of. I hope someone sees this and decides to bring it back to what it was. The architecture is stunning. It is tragic to see such a lovely building falling apart. Has there been no move to preserve the inside? I feel sad that no commercial organization has seen the value in this building, and tried to instill new life into it. What a beautiful building – how sad to see it dying. Marvellous pics! Truly the hidden side of America. Congrats on FP and thank you for sharing. Such a shame to save the outside of a place but let such a beautiful interior fall to pieces. Any place that showed adult entertainment in the 1970’s would have a lot of sticky stuff on its seats. And I am not talking chewing gum either. So if anyone is contemplating a renovation it better be for evangelical crusades where the pastor gets the girl in the end. Your photo’s are wonderful and you’ve managed to show it’s beauty under it’s beating. Thank you for highlighting such a beautiful piece of history. Great stuff! What a pity these beautifull places are neglected or to be destroyed. is this where they filmed some of the scenes for the film Twelve Monkeys starring Bruce Willis and Brad Pitt? No, that was filmed at the Senator Theatre in Baltimore, MD. How is this shame possible in Brooklyn? Interesting place. I believe this place is still good for photo shoots. But then again, what a waste. They should have preserved it. This is a really interesting story. Please do more around the United States. I love old and abandoned structures but this one is so beautiful! Thank you for sharing! Awesome shots! 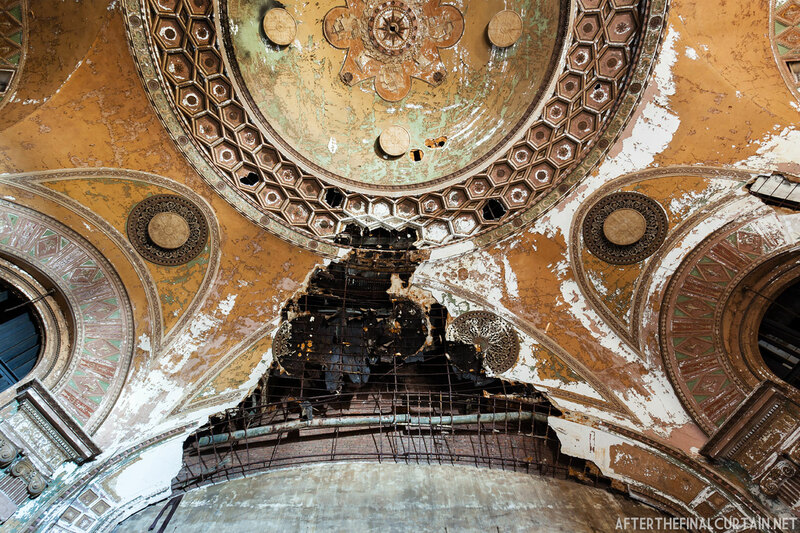 My boyfriend really enjoys capturing urban atrophy and falling-apart buildings — will share this series with him. You’ve done a wonderful job of reveling the sensuous curves of this theatre. How sad to learn that the exterior is deemed historic, but the interior could be gutted. Love your eye! Start a local foundation to revive the theater. It can have many uses, if not only for educational events. It does have a beautiful architecture and it should be renewed and preserved. Great shots. Thanks for posting this. Such a shame, but yet it is so beautiful in its decay. Sad to see it in such decay. I love old movie palaces/theatres. Beautiful theater. Your photographs do it a great credit. i wish it couldn’t be just a landmark, somebody can turn it into something beautiful that attracts tourist, like musee d’orsay in paris which formerly a discarded train station. that’s right, europe excels much more about old buildings restoration. i guess the US needs to learn from europe. interesting subject. 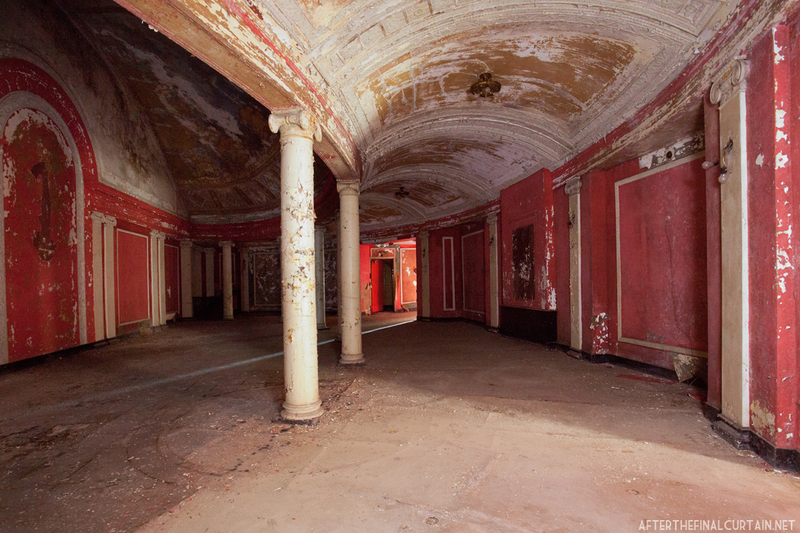 did you just get in the former theater to snap pictures or you need a permission from a security guard? What a pitty… It must have been really nice! 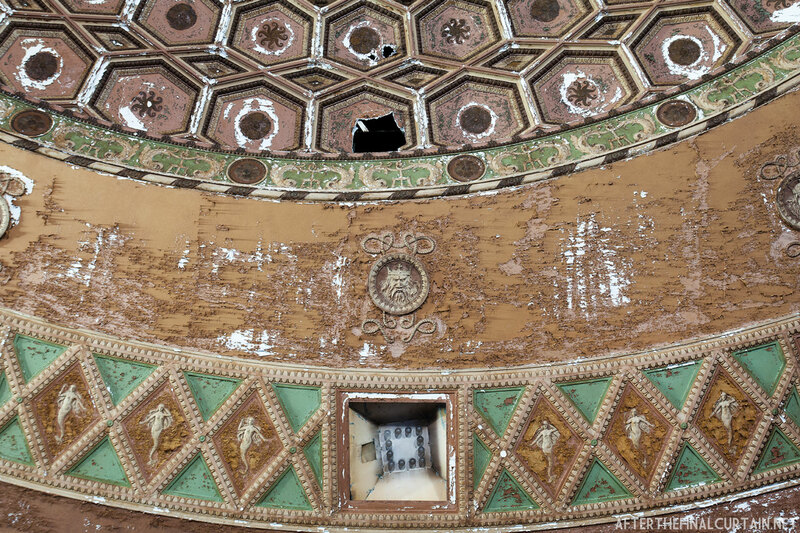 While I love old, abandoned buildings, I really hope this theater finds some help. Thanks for sharing, beautiful pics! Brilliant piece. It’s so rare to see something this good get any notoriety on FP, so I’m glad for you. I could look at these pictures over many times. Great Job! 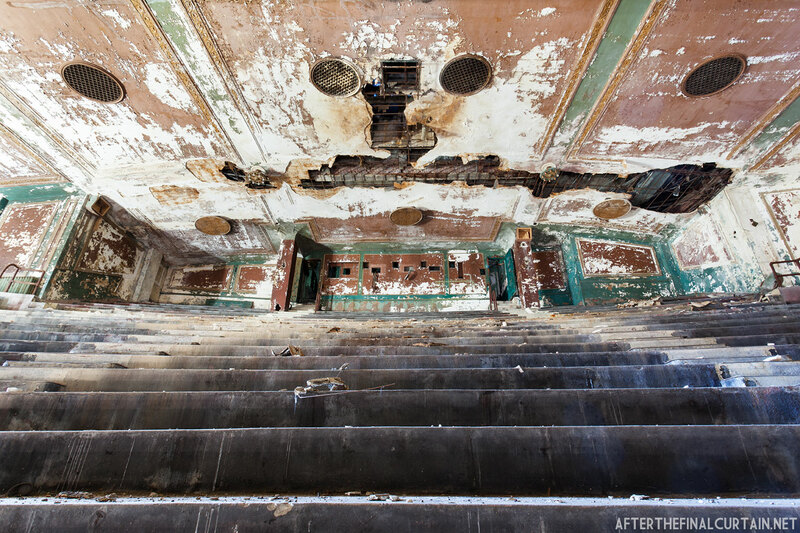 Your photography really captures the grandness of the theater despite it’s decay. It’s a shame that didn’t preserve it. So beautiful, that would be a shame if it was demolished. I have always been fascinated by abandoned architecture, ghost towns, etc. It’s always fun to imagine what it must have looked like or been like back in the day. One eerie place I’ve always been curious about is the zone of exclusion around Chernobyl in Ukraine. The photos are awesome and haunting, thanks for bringing this beautiful place to our attention. In the 1970’s, Atlanta’s Fox Theater was saved by a push from the people of Atlanta. It would be amazing to see the same thing happen for the Shore. This is a beautiful piece of architecture. It’s sad to think of it sitting empty… it might be even more sad to envision it as a bingo hall! Oy! I agree with Loew, “People buy tickets to theatres, not movies.” I hope the place has a future! That’s some relic to be restored Karen, perhaps a dream project. Really haunting — so happy JM turned me on to your site! My favorite shot is the red foyer, but that view down from the balcony gave me vertigo!! 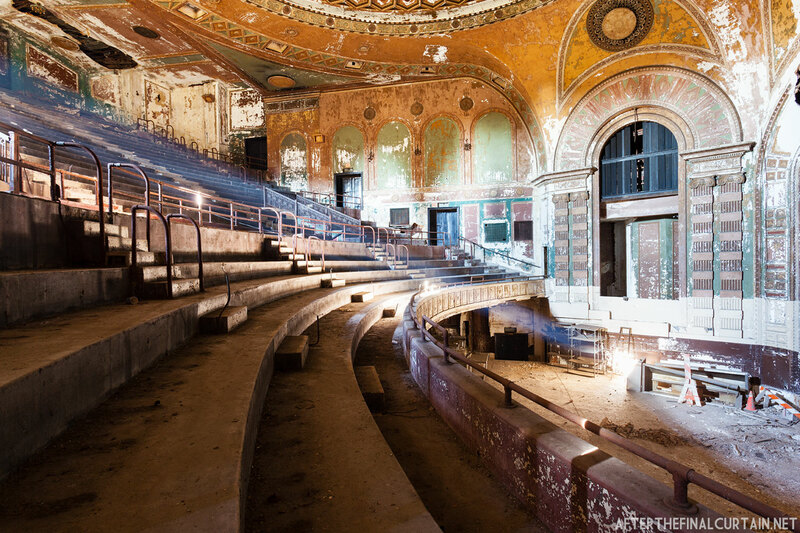 I am wondering if you ever saw the beautiful photo essay on Detroit called “Detroit Disassembled” that opened in 2010 in the Akron Art Museum — I think you’d like it! 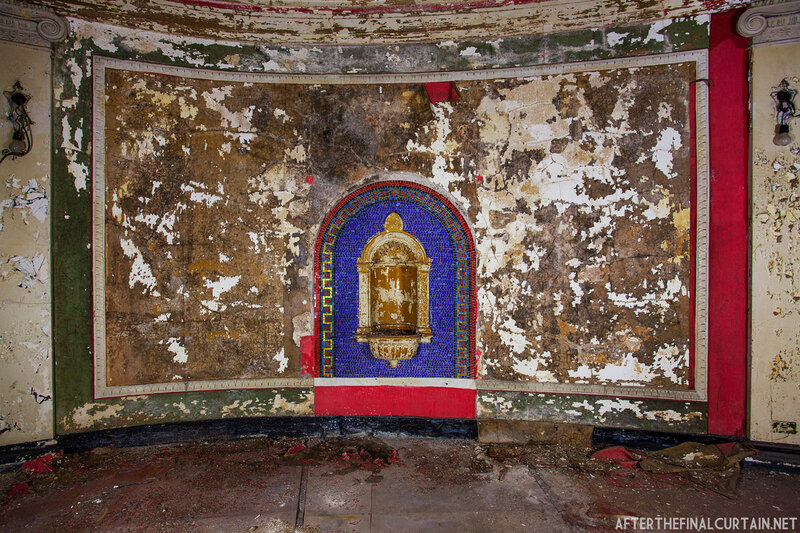 Great post/wonderful site … I hate losing these magnificent old buildings!! 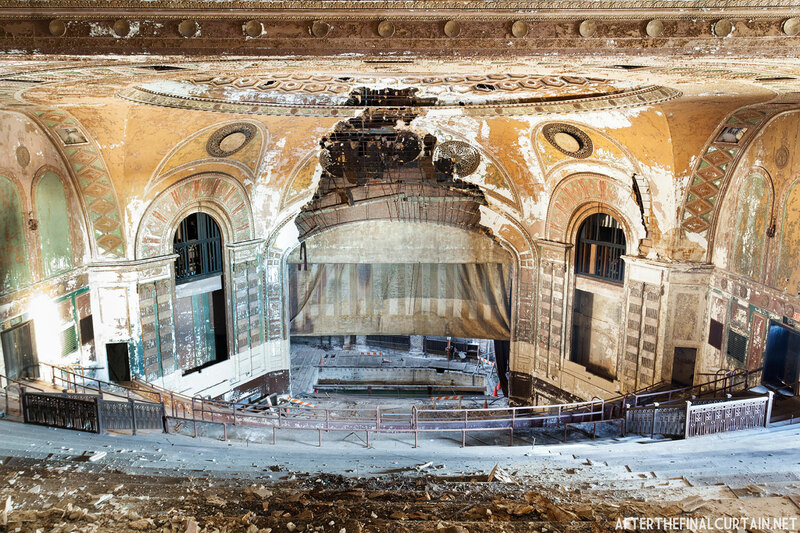 I have seen “Detroit Disassembled” The photographer Andrew Moore photographed a theater in Times Square I never got the chance to photograph. It was recently converted into a barbecue restaurant. It’s sad how a building that is less than 100 years old can be left to ruin yet buildings in Europe have stood for hundreds of years. Shame on us. I have just discovered your blog! amazing photos! I will visit again your blog ! Last time I was inside was 1969. Hi Matt – Fantastic to hear that this building will have a new lease of life. As a pipe organ builder, it is always sad to see evidence of a theatre organ left to decay such as in your photos of the Shore. I see wooden chamber shutters and what are obviously organ parts within the top levels either side of the proscenium. Did you manage to get up there to take any photos? I’d imagine all the metal organ pipes were sold for scrap and only the chest work and lumber remains? Hi John – I photographed the Shore about 5 years ago, and I don’t recall seeing any pipes up there, but that doesn’t mean there weren’t any. Matt, your work is never anything short of breathtaking. We need you out there documenting what is in danger of being lost forever. Maybe some day they’ll start paying attention. I really hope that when they build the hotel, they retain as much of the original building and details as possible — it’s so beautiful! Thanks for sharing! Me too. It seems like the facade of the building will remain pretty much the same, but the interior will change.